Another ceramic piece in its second stage - white underglaze (two coats) ready for the colour. It's kind of like a jewelry box, with a high gloss prussian blue inside the box. I haven't quite decided how to glaze this new set of ceramics. 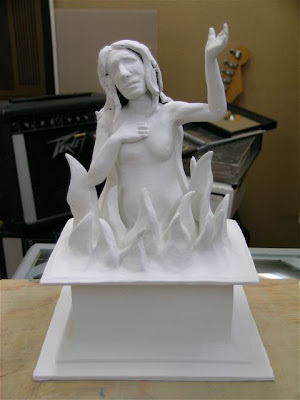 Many of them have flames (animas - as below, phoenixes and scenes of hell) but I really don't want to use red and I'd rather glaze them monochromatically so that I don't lose any of the form, as that's the main reason why I'm making these ceramics. Although I've just finished a few retablos that are monochromatic. That's the problem with art, It doesn't matter how much you plan out something,(especially painting) it ends up being the muse calling the shots, not you.